Q1: How can I set up the watch with my Android Smart Phone? connect the watch with the Android smart phone by bluetooth, then then watch will work well with the smart phone, and all features works. Q2: Does an APP work for IOS phone? A2: No, there is no App work for IOS phones. So, remote control and sync message function can't be used for IOS system. Q3: Is it waterproof ? A3: Yes, it's life waterproof. Q4: I can not download the APP by scanning the QR code from the watch, what do I do? A4: Please go to Google Play store to search the Funrun App and download it. Phone Function:If you put a Nano SIM card in this smart watch, you can make phone calls directly from the smartwatch, including answering and dial-up, We recommend the T-mobile GSM SIM card. 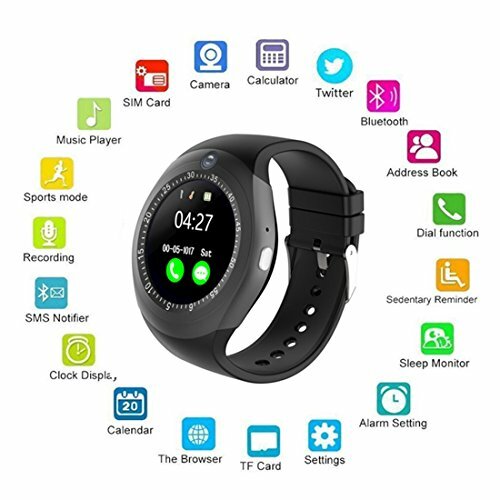 Bluetooth Function:You don't need to put a SIM card into the smart watch, you just need to connect the watch with your mobile phone by bluetooth, then you can make calls, answer calls, view SMS messages and so on. Smart Notifications: connect your Android smartphone via Bluetooth, it supports receive push notifications from Anti-lost,Calls, Message, E-mail, Whatsapp, Facebook & Twitter etc(Only support Android phone). If you have any questions about this product by Amter, contact us by completing and submitting the form below. If you are looking for a specif part number, please include it with your message.